Pause every so often when gardening to celebrate your breathing. Lavender has been used for centuries as an herbal remedy, and does indeed appear to have antiseptic, anti-bacterial, anti-fungal, anti-inflammatory, anti-convulsive, and last but certainly not least - anti-depressant properties. The fresh or dried flowers contain the medicinal properties of Lavender. For internal use the essential oil is often placed on sugar cubes - 1-3 drops per cube. Unfortunately unless you have a home still, and knowledge of the distillation process for essential oils, you have to purchase the oil. This purchased oil is capable of making you very nauseous, and most vendors advise against taking it internally except in very small doses. However, the flowers make a relaxing and refreshing tea with the same basic medicinal properties, and using Lavender in this way is advisable in most cases. 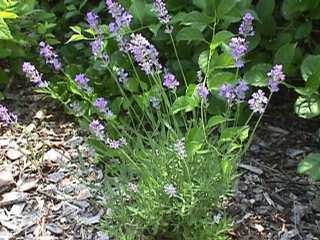 Internally, Lavender is believed to be of benefit for a multitude of problems, including stress, anxiety, exhaustion, irritability, headaches, migraines, insomnia, depression, colds, digestion, flatulence, upset stomach, liver and gallbladder problems, nervousness, loss of appetite, and as a breath freshener and mouthwash. Inhaling the essential oil in some cases has been reported to work as well as narcotics for inducing relaxation and sleep, easing symptoms of depression, and reducing headache pain. For inhalation purposes, boil 2 cups of water, add 2 drops of essential oil, and inhale the steam. Externally, Lavender oil is one of the safest essential oils and can be used full-strength on the skin. It works wonderfully and can be applied directly for cuts, scrapes, wounds, burns, bee, wasp, and insect stings, rashes, muscle aches, rheumatism, arthritis, cold sores, canker sores, blisters, bruises, athlete's foot, and rubbed directly into the temples in case of headache or migraine. Miscellaneous uses of Lavender include using unsweetened tea as a hair rinse to help reduce hair loss and dandruff, using the dried flowers in sleep and dream pillows, in potpourris, sachets and tucked in drawers to freshen clothing and repel moths. A few drops of oil dropped into warm bath water is a refreshing and relaxing treat. The stems with the leaves stripped can be burned like an incense stick, and can also be used in crafts such as basket weaving, and making Lavender wands.